Makarov pistols will also become a thing of the past for Russian police officers. Replacing it is a Yarygin pistol nicknamed ‘Grach’. First Deputy Interior Minister Mikhail Sukhodolsky said the new small arms are better suited for combat at close quarters. They use ammunition with enough stopping power but less chance of ricochet. The rearmament will take several years to complete. Priority will be given to arsenals that the police use in everyday duty. The PP-2000 sub-machine gun was developed in Tver and first revealed to the public in 2004. Its light, compact and durable design makes it a perfect personal defence or close quarter weapon. It can fire armour piercing rounds when engaging protected enemies or standard 9mm rounds. Its distinctive feature is a slot in its back that can be used to attach a fold stock or store a spare 44-round magazine that doubles as a stock. 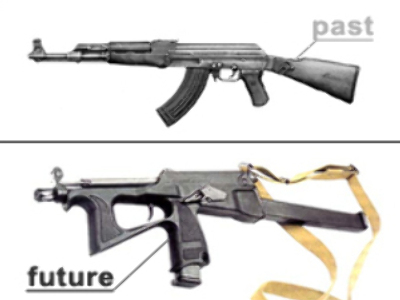 The PP-19-01 SMG is a modification of the PP-19 Byzon design that was developed for the Vityaz counter-terrorism unit, which gave its name to the weapon. It can fire a range of 9mm rounds including armour piercing ammo. It’s intended for use in operations that require a high rate of fire and supreme accuracy at short range. The Yarygin pistol (MR-443 Grach) is the designated replacement for the Makarov pistol as a sidearm for Russian military units. It is a semi-automatic weapon chambered for the 9mm 7N31 armour piercing rounds, but can also fire other 9Ã‘â€¦19mm rounds.